The introduction of Islam in the 7th century AD further defined the region’s culture. Within a century of its birth in the Arabian Peninsula, Islam had spread west to the Atlantic Ocean and east to India and China. It fostered a dynamic period of great learning in culture, science, philosophy and the arts known as the Islamic “Golden Age." 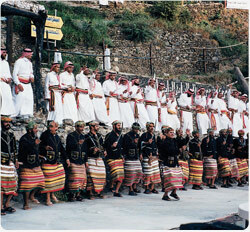 The most famous cultural event in Saudi Arabia is the Jenadriyah Heritage and Cultural Festival, organized each year by the National Guard. For two weeks a year, the festival gives over a million Saudis a glimpse into the past. Opening with a traditional camel race, the festival includes almost every aspect of Saudi culture. Artisans, such as potters, woodworkers and weavers, demonstrate their traditional crafts in small shops with typical palm-frond-roofed porches. Visitors can also stroll through the past in a heritage village, wahich resides permanently in Jenadriyah. At these exhibits one may watch a metalsmith fashion a traditional brass and copper coffee pot. A wood carver slowly transforms a piece of wood into a saddle frame. Basket makers weave palm fronds and straw into hats, baskets and containers decorated with colorful designs. 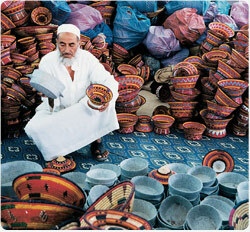 A potter using a foot-powered wheel shapes clay into bowls and water jars. Leather is cut and shaped into sandals, pouches and bags. Large planks are cut and fashioned into doors and windows that have intricate carvings and inlays. Blacksmiths heat chunks of iron in a furnace and hammer them into gleaming swords and daggers. A tailor hand-sews golden threads into the collar of a man’s cloak. 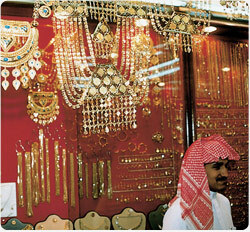 Jewelers fuse precious metals and mount semi-precious stones to make intricate bracelets, necklaces and earrings. Craftsman put together ingenious wooden pulleys used in the old days to laboriously draw water from wells for irrigating crops. 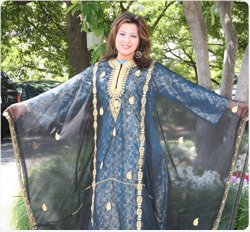 In addition, folklore troupes perform the ardha and other national dances, while singers from around the Kingdom perform traditional songs and music. Literary figures from across the country participate in poetry competitions between contemporary poets reciting historic verses.